The Astoria Tumbleweeds doth roll, and the wheel of the year turns. The gloomy skies of late December and early January are less than inviting in the City of Greater New York. Cold – and rain – coupled with a general sense of annual ennui and thwarted personal ambition, contribute to a dire outlook and general sense of malaise. Bones creak, tendons stretch painfully, and the extremities are rendered numb as vital fluids retreat towards the core. Regardless, a humble narrator marches forth, in pursuance of presenting the truth of our times in graphic narrative – at this – your Newtown Pentacle. 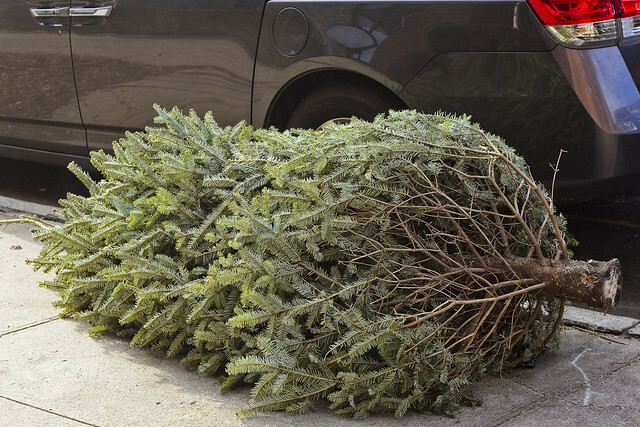 Raised in the Hebraic culture, it has always struck one such as myself strange that the Goyem cut down trees and drag them into their homes in December, only to cast the dearly held verge aside in January. 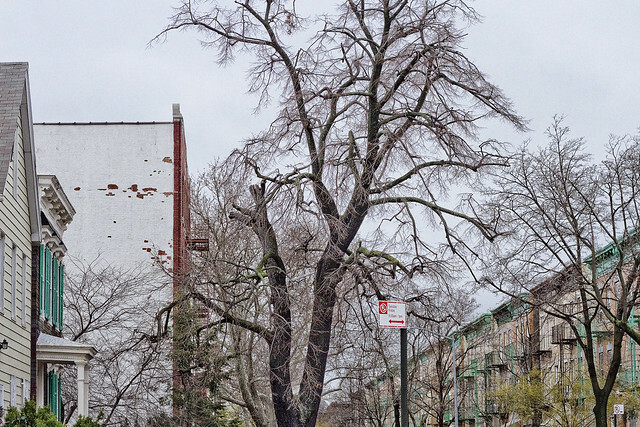 The tumbleweeds of Astoria have been often mentioned here. The corpses of trees abandoned, and carried by the sciroccos of Queens which cause them to drift along the concrete hereabouts unheralded. 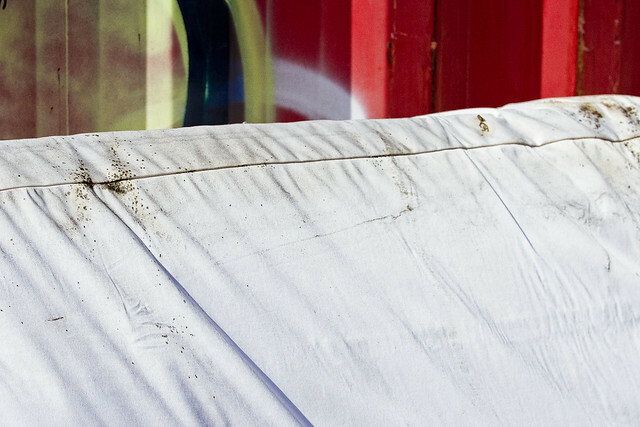 Thirty, sixty, even ninety days hence – their dehydrated corpses will be observed still rolling around the “via publica” – stripped of their verdance. Wild agglutinations of kindling will be observed sticking out of snow banks, or adorning the abandoned fence lines of construction lots. 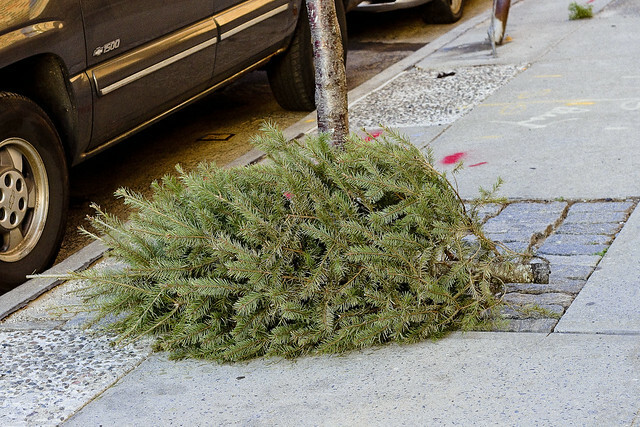 As opined, the native art form of the borough of Queens seems to be illegal dumping, and never has this statement been truer than when the subject of Christmas trees and decorations is brought up. Observance of the habits and mores of the Sanitation department has revealed an unexplainable, and certain, reluctance to collect this particular specie of refuse. Officialdom encourages the gentry to bring the cast away trees to certain locations, usually accessible only by motor vehicle, for mulching in pursuance of creating compost. 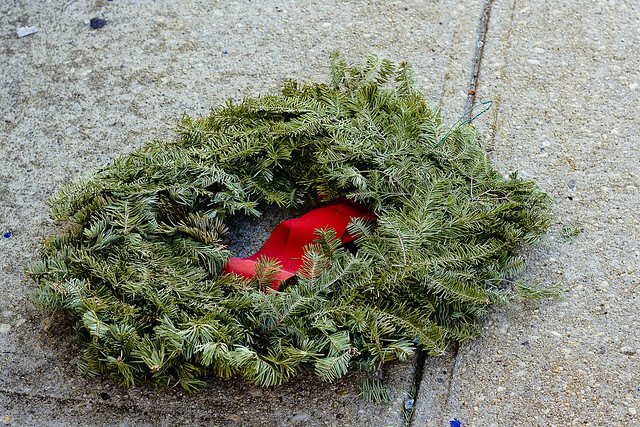 As this would require effort on the part of the citizenry, it’s simpler for the average Queensican to just leave the thing on the sidewalk, or dump it along Skillman Avenue, and allow the wind to carry it away. 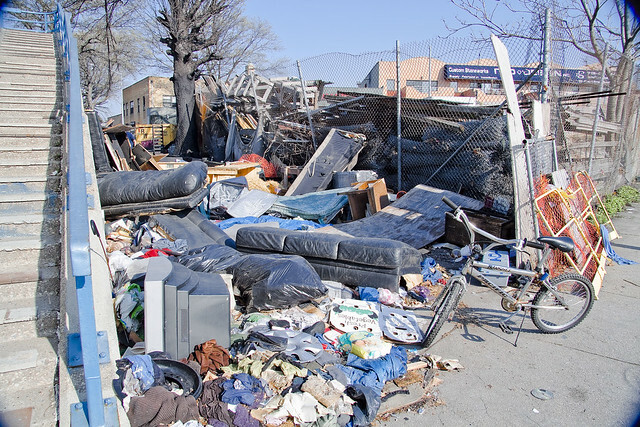 Illegal dumping is something that a humble narrator sees everywhere he goes in the borough of Queens. 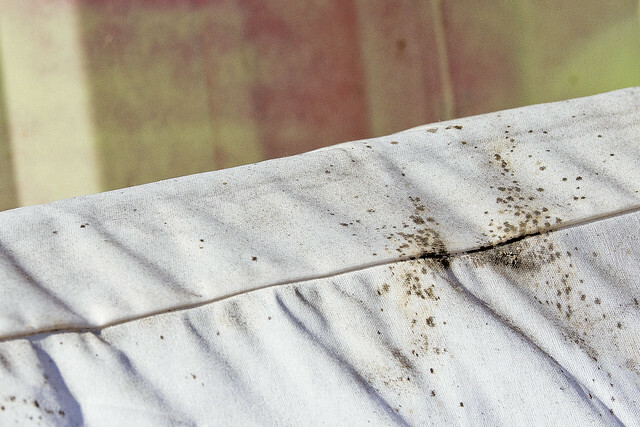 Some of it is simply explained as emanating from low tier building contractors attempting to avoid the cost of disposing of construction waste – manifested as a pile of contractor bags filled with dry wall or plaster that you’ll see under a rail trestle or along an industrial facilities’ fence. There’s the domestic furniture as well, and odd agglutinations of paint cans and sometimes spoiled food stuffs. 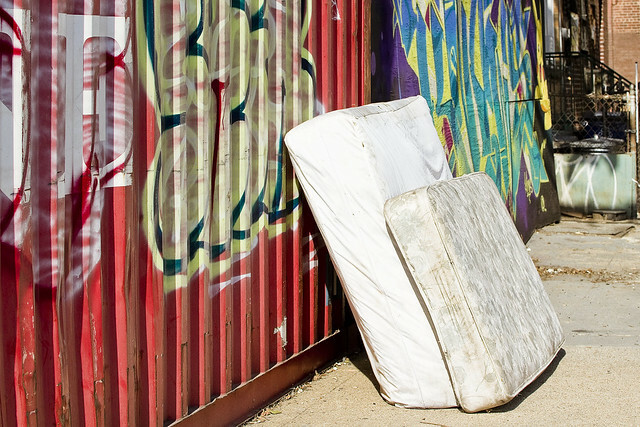 A recent change in the rules enacted by State and City Governments concerning curb side pickup will undoubtedly be feeding a new phyla of curbside dumping – electronics. 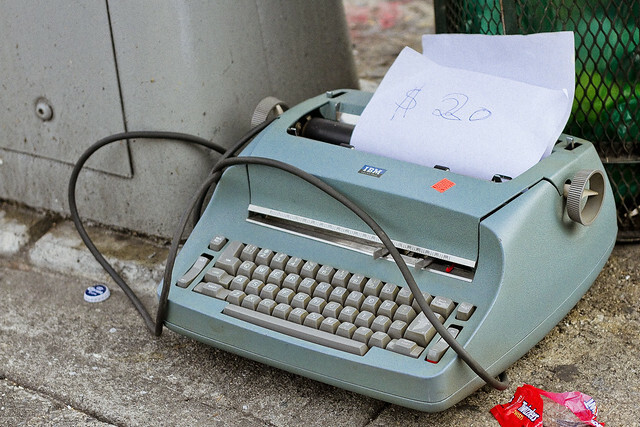 The State of New York recently changed the law regarding electronics disposal, which as of April 1st of this year, make it a fineable offense to place commonly held items on the curb for DSNY pickup. 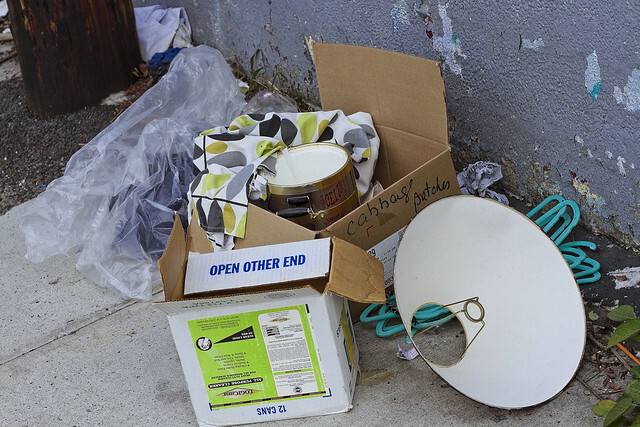 A full list of the offending items can be accessed here, and the City has created intake centers – one in each borough – for electronics to be disposed of legally. In Queens, it’s in College Point, which is fairly distant for most of us and impossible to access without a motor vehicle. Get ready to witness a new flowering of the native art form of Queens this spring. The reason I call it an art form rather than a misdemeanor in our fair Borough is due to the careful placement and juxtapositioning of abandoned trash. Brooklyn? Haphazard and rushed dumping with nary a consideration for negative space. Manhattan and the Bronx? Disorganized piles and middens of trash placed with no aesthetic care. Staten Island? 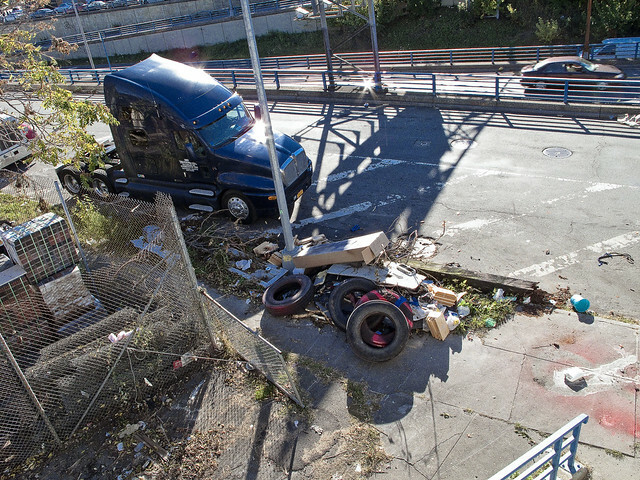 You don’t see a lot of illegal dumping on Staten Island, or at least I don’t. That’s because you’ve got a predominance of DSNY workers living there, and the garbage men like their nests neat. Cloudy days and colorless nights are all that one such as myself can look forward to, and it is only within the wasted devastations of the Newtown Creek where memories of succor and happiness might be found. In such a spot, and for several months in fact, these trailers of automotive tires have been sitting. 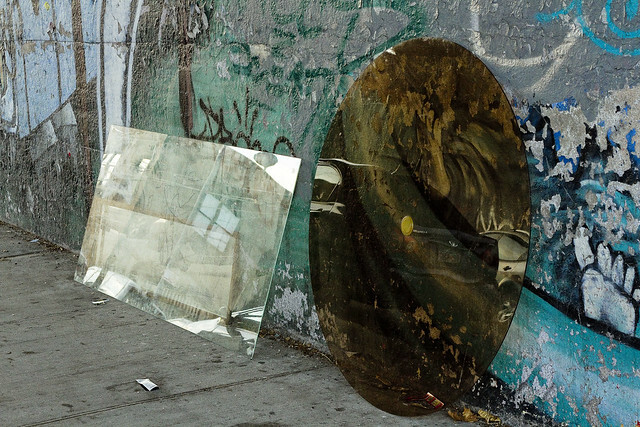 Seemingly abandoned, one knows not the purpose of their corporeal presence at the Vernon Street End here in Long Island City, but given the long history of dumping in the area- one presumes their status as circumspect. It should be mentioned that the trailers have license plates and identifying marks, which is unusual for such scenarios. 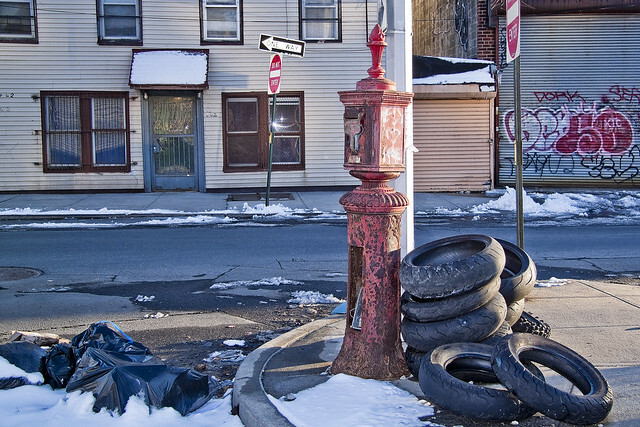 Tire stockpiles create a great health and safety risk. Tire fires can occur easily, burning for months, creating substantial pollution in the air and ground. 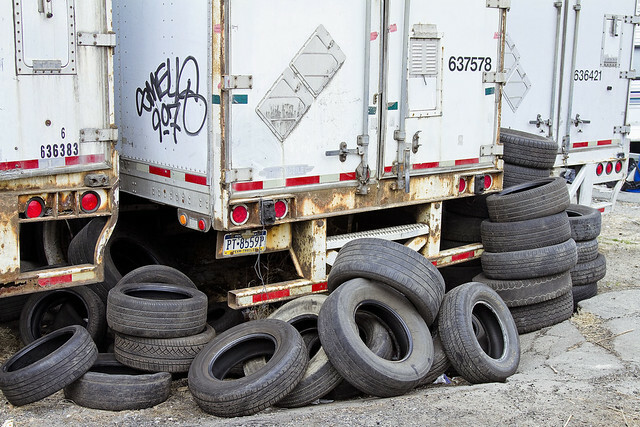 Recycling helps to reduce the number of tires in storage. 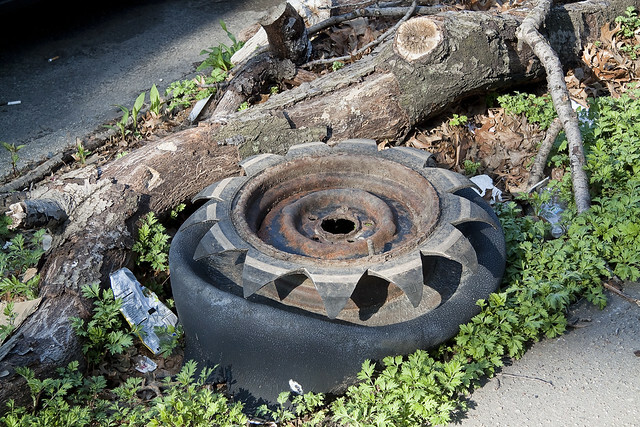 An additional health risk, tire piles provide harborage for vermin and a breeding ground for mosquitoes that may carry diseases. 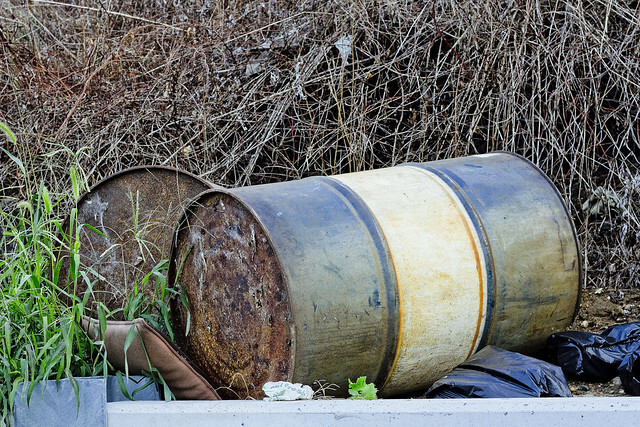 Illegal dumping of scrap tires pollutes ravines, woods, deserts, and empty lots; which has led many states to pass scrap tire regulations requiring proper management. Tire amnesty day events, in which community members can deposit a limited number of waste tires free of charge, can be funded by state scrap tire programs, helping decrease illegal dumping and improper storage of scrap tires. Four of these trailers have been here since at least late January. You can see them in the background of this shot from the 22nd day of 2013. 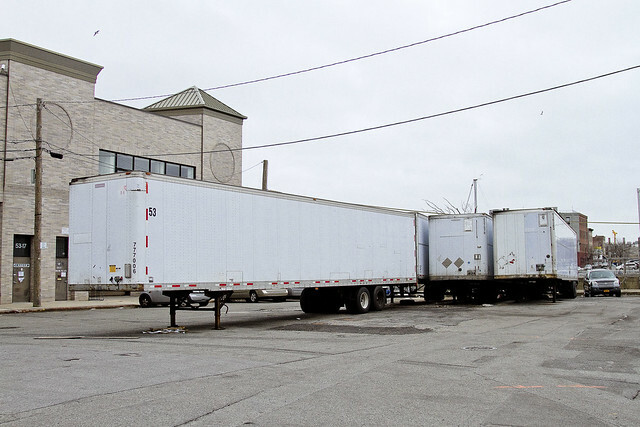 At various intervals, the doors of more than one of these trailers have hung open before me, and they are all full of tires. Mayhaps there is some legitimate and wholesome purpose for their presence, which is beyond my reckoning. It’s not as if 4 seemingly abandoned trailers, parked in proximity to the Buckeye Pipeline and directly over the G train tunnel (and within throwing distance of a rail yard and the Midtown Tunnel) would be noticed or investigated by the same security and law enforcement personnel who will regularly inquire “what are you taking pictures of” of me from their squad cars. This is Queens. Security theater is the practice of investing in countermeasures intended to provide the feeling of improved security while doing little or nothing to actually achieve it. The term was coined by computer security specialist and writer Bruce Schneier for his book Beyond Fear, but has gained currency in security circles, particularly for describing airport security measures. 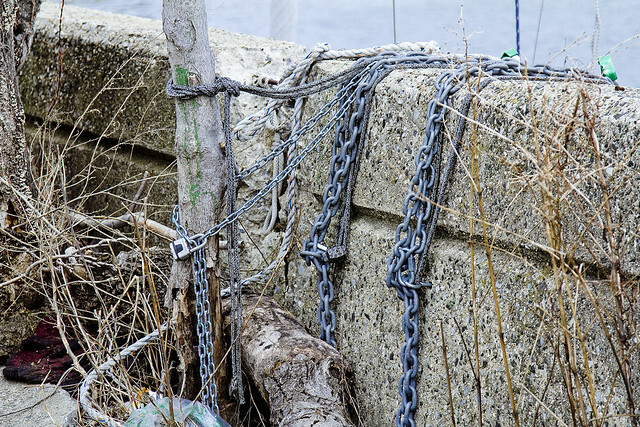 For those of you used to the Brooklyn point of view, these are the slabs of cement that the boat people are tied off to on the Queens side of the Newtown Creek, around a block from the LIRR yard. Nothing to worry about, go back about your business. 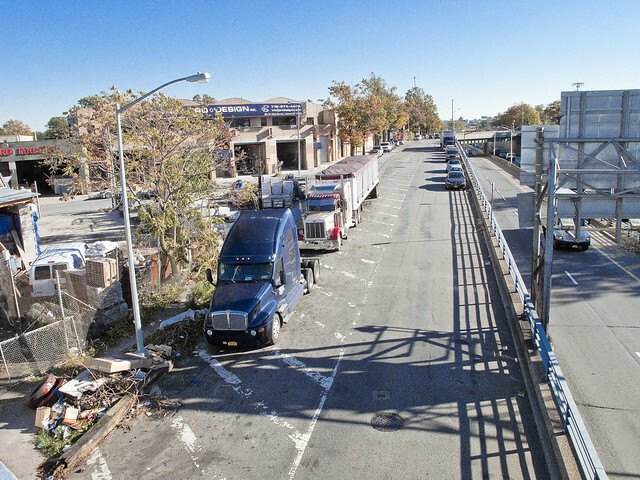 This was once the home of the Newtown Creek Towing Company, incidentally, right alongside the Vernon Avenue Bridge. 1908 image from “Illustrated History of the Borough of Queens, New York City By Georg von Skal, Flushing Journal, Flushing, N.Y” – courtesy google books. That’s Brooklyn on the right, Queens to the left. The situation here continues to scare the hell out of me, but no one seems particularly concerned about it. To my admittedly age ravaged eyes, this doesn’t look so safe. The heavy concrete blocks which support the ad hoc moorings of these boats is clearly and inexorably being pulled toward the Creek. Never mind the fact that they are docking in the direct outfall of a combined sewer pipe. Sometimes, during heavy rain and snow storms, combined sewers receive higher than normal flows. Treatment plants are unable to handle flows that are more than twice design capacity and when this occurs, a mix of excess stormwater and untreated wastewater discharges directly into the City’s waterways at certain outfalls. This is called a combined sewer overflow (CSO). We are concerned about CSOs because of their effect on water quality and recreational uses. 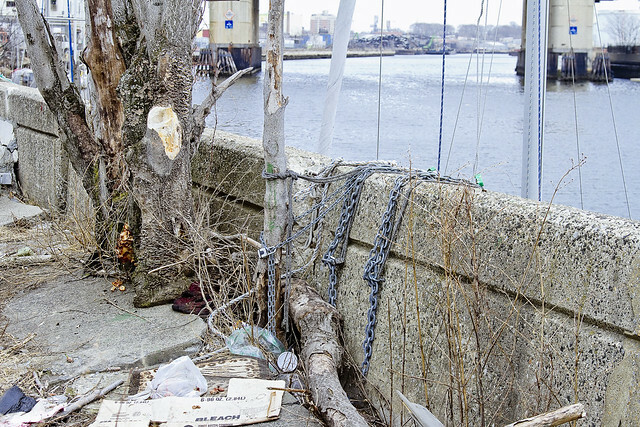 Anyway, that’s the scene at the ragged border of Queens known as Newtown Creek and the Vernon Avenue Street End in the early spring of 2013. It has been decided to do an occasional series of posts which are strictly “here’s what is there” in nature, simply to document the place as it begins a season of tremendous change. 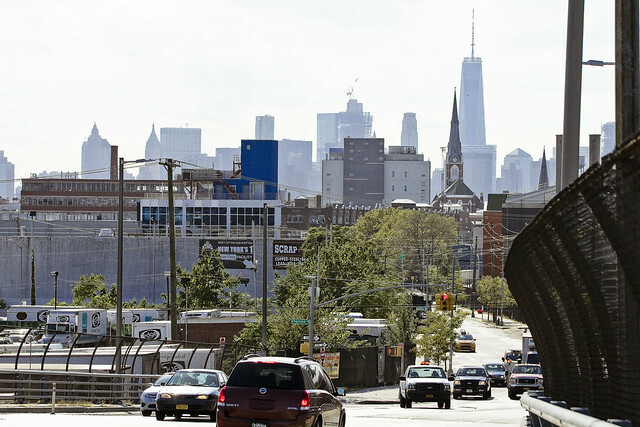 Hunters Point South has begun, and the Kosciuszko reconstruction will be starting up this fall, Greenpoint Landing is not far away either. 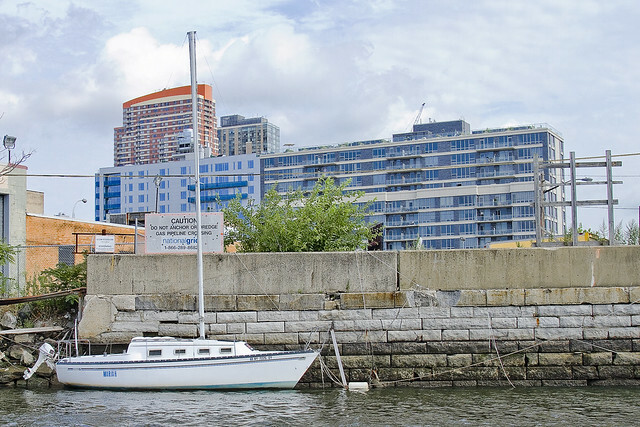 This is the penultimate year for the Newtown Creek’s 20th century incarnation, which will be utterly altered, upgraded, and updated in the next decade. 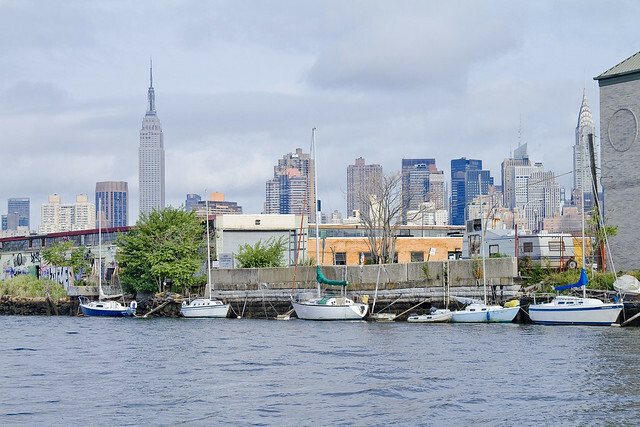 Newtown Creek is a 3.8-mile long tidal water body located in the City of New York, having five main tributaries (Dutch Creek, Whale Creek, Maspeth Creek, East Branch and English Kills) and is itself a tributary of the East River. 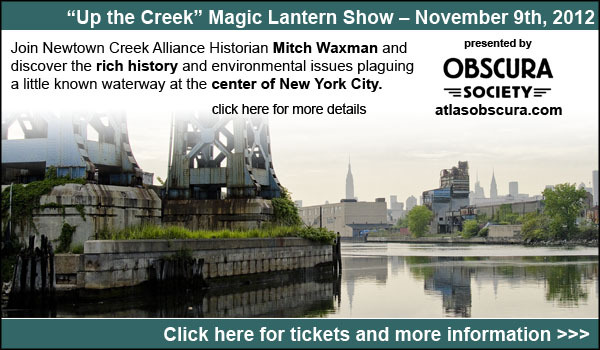 The creek is a part of the New York – New Jersey Harbor Estuary that forms the north-south border between the New York City boroughs of Brooklyn and Queens. 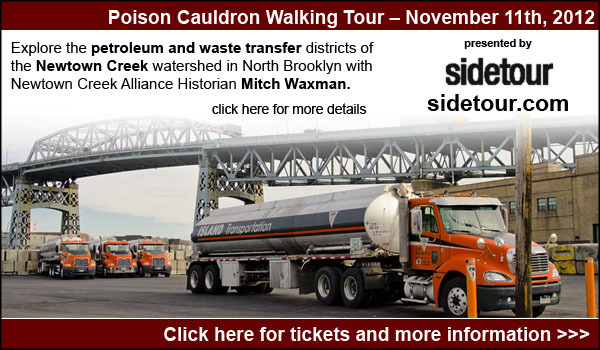 The Newtown Creek area has a history of widespread industrial development dating back to the 1800s. 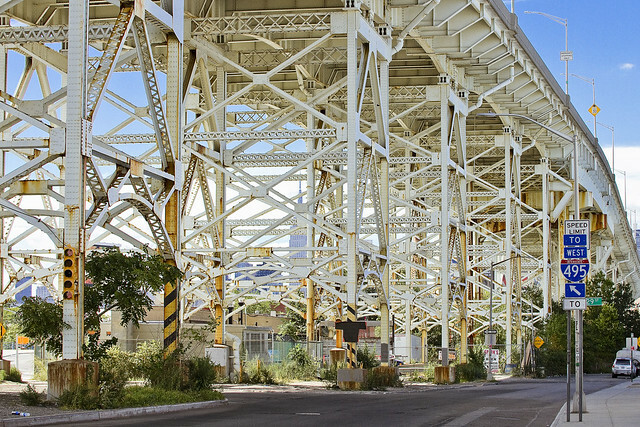 In the mid-1800s, the area adjacent to Newtown Creek was one of the busiest hubs of industrial activity in New York City. More than 50 refineries were located along its banks, including oil refineries, petrochemical plants, fertilizer and glue factories, sawmills, and lumber and coal yards. Newtown Creek was brimming with commercial vessels. During World War II, the creek was one of the busiest ports in the nation. This historic development has resulted in changes in the nature of the Creek from a natural drainage condition to one that is largely governed by engineered and institutional systems.